What if I’m good at it? even knowing what they’re capable of. 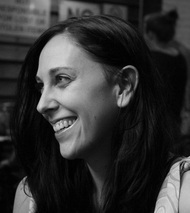 Victoria Lynne McCoy's work has appeared or is forthcoming in Drunken Boat, Best New Poets 2012, Boxcar Poetry Review, and PANK, among others. A Southern California native, she earned her MFA from Sarah Lawrence College and currently works for Four Way Books in NYC. She is also a member of The louderARTS Project and is the poetry editor of Four Way Review.